PRODUCT DESCRIPTIONS: This devices emits a powerful sound wave which falls into the "stress" sound range of many animals. It relies on AC power so you will need to install it close to an electrical power outlet. This unit is always on. In other words, it does not employ any type of motion detector to activate a sound release. Once turned on, this unit will continuously emit ultra sound waves. By targeting this high frequency sound range, this device will both alert and alarm nuisance animals that are not native to the surrounding area. Once the animal hears the sound, it will attempt to avoid the sound and move away. Ultra sound technology has proven to work best on newly active and roaming animals. Animals which have been feeding or roosting for any length of time will attempt to ignore the sound so additional control methods may be needed to get initial control of established animals. For this reason, it is not suggested that you attempt to "chase off" nesting or feeding animals that have been present for any extended period of time (several months). For established animals, you will first need to employ one of the other control methods detailed in our article if you wish to get the quickest results possible. Only when the nesting animal is relocated and not present should you consider the installation of Ultra Sound devices which will then chase away new animals trying to habitat the vacated territory. WHERE TO USE IT: This unit is not weather protected. It's designed for indoor use but can be used outside where you have a protected area which will not get wet. 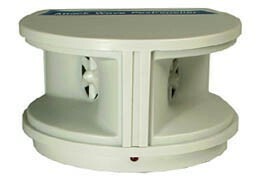 RATE OF APPLICATION: This unit will cover an area up to 4000 sq/ft for small animals like Mice, Rats and Squirrels or Bats. Use it in areas up to 2000 sq/ft for large animals like Armadillo, Feral Cats, Deer, Stray Dogs, Raccoon, Skunk or Rabbit. 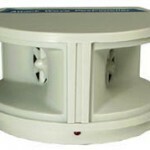 This unit is best suited for use inside but in protected areas, can be used outside.